It might not feel like it, but it’s been almost three years since the original Amazon Echo hit the scene. In the time since, the number of Alexa-powered devices has grown from a single smart speaker into an entire family including the Dot, the Look, and the Show—not to mention all the third-party devices out there. 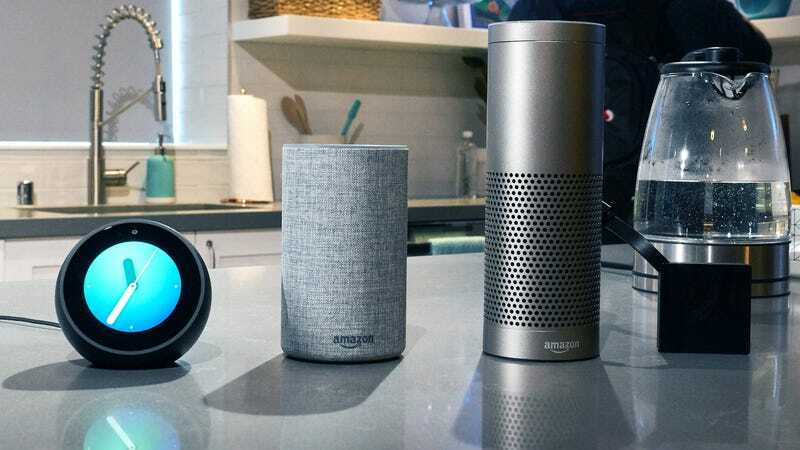 But now, Amazon has returned its attention to the device that got the whole smart speaker revolution started with an all new Echo (along with a ton of other new Echo devices, too). Available today for $100, the new Echo’s main improvements come in the form of second generation far-field microphones for more accurate voice recognition. The new Echo also received a face lift thanks to a more squat, redesigned body and the option to swap in one of six different fabric or wood veneer color shells. This should let the second-gen Echo stack up much better against the $129 Google Home, which for a while had been undercutting the OG Echo. And if you’re considering decking out your house with multiple new Echos so you can use them as wireless speakers, Amazon is offering a 3-pack for $250 ($50 off). In addition to a new lower-priced Echo, Amazon also revealed the $35 Echo Connect, which works plugs into your landline and operates as a speaker phone, so you can call your mom, who refuses to get an Echo, via the landline while enjoying what Amazon hopes is a convenient Alexa experience. For those who want even more than what a standard Echo can do, Amazon also announced the $150 Echo Plus, which adds full on smart home hub functionality on top of Alexa’s traditional voice-command duties. The Echo Plus (which looks a lot like the original Echo, but comes in three colors) features Zigbee support and will come packaged with a single Philips Hue white light bulb to get people started on the smart home improvements. It’s also got improved speakers, including a tweeter and woofer for better audio. While we haven’t had a chance to hear it beside an original echo, Amazon representatives claim the sound is noticeably improved. What might be the most unusual addition to the Echo family are the new Echo Buttons. They come in packs of two for $20, but instead of being tied to a specific device or vendor like Amazon’s Dash Buttons, the Echo Buttons are multipurpose gadgets that Amazon says can be used to play games or other activities. Oh, and in case you didn’t think there were enough new Echo devices, Amazon also announced the new $129 Echo Spot, which is basically an improved Echo Dot with a circular 2.5-inch screen. Like the Dot, the Spot has Bluetooth and a line out audio jack so you can connect it to something with more substantial speakers. Despite the deluge of new Echo gadgets, there was one curious omission: Amazon’s rumored Alexa-powered glasses. As recently as last week, reports indicated the Amazon was working on a pair of glasses with bone-conducting speakers that could be tethered to your phone, so you can communicate hands-free with Alexa wherever you are. But it seems that device isn’t quite ready for primetime, as Amazon made no mention of it during its latest Echo presentation.